Greenleaf Book Group Press, 9781626342729, 272pp. Author Tyra Manning learned that her husband had been killed in the Vietnam War from her psychiatrist at the Menninger Clinic, where she had been hospitalized for clinical depression. After years of battling addiction and depression, and coping with the tragic loss of her father at a very early age, Tyra's worst fear had come true. Larry had been shot down over the Laotian jungle while flying a top-secret mission, just two weeks before their daughter's second birthday. In this beautifully written, poignant memoir, Tyra Manning recounts how she was able to persevere in the face of devastating loss. With courage, love, and determination, she overcame her grief and fulfilled promises she made to Larry before he left for Vietnam. She ultimately earned a doctorate of education from the University of Kansas and became one of the nation's top school superintendents. When Tyra received a call from the air force in 2006, she was able to keep one last promise to Larry. His remains had finally been excavated after thirty-five years, and she was able to honor his wish to be buried at Arlington National Cemetery. 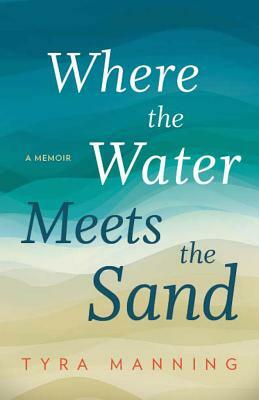 Where the Water Meets the Sand explores themes of loss, depression, addiction, courage, and love and offers hope to individuals and families who have also dealt with the loss of someone close to them. Dr. Manning defies the stereotypes associated with mental illness. Those who know her as a successful schoolteacher and administrator are surprised to learn of her long-time battle with addictions and clinical depression, trials she faced both before and after her husband was killed in Vietnam. After retiring from a forty-year career in education, Dr. Manning has devoted her energies to comforting those suffering in silence, reducing the stigma associated with mental illness, and opening doors to resources for support and treatment. Though she travels around the country delivering the messages and lessons in her new book, Dr. Manning is a born and bred Texan currently residing in Texas Hill Country with her border collie mix, Bella.